Let’s start with Radio Buttons. When the information is submitted, we are going to generate a confirmation page with the information entered in the form above. 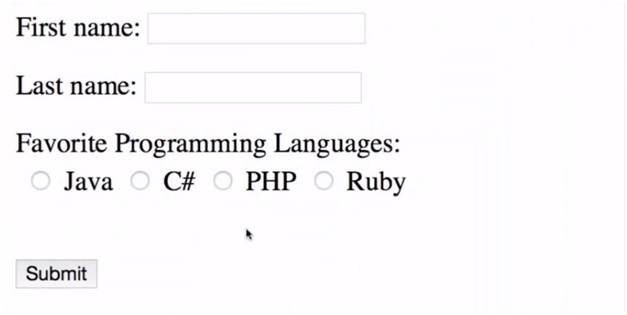 Let’s add this code snippet to the complete form, so that we can have a better idea of how to put it all together. See this is pretty straight-forward. We just added radio buttons to the form we have been playing with for quite a while. Now let’s code the JSP page. Now when you try to test it, make sure to run the form we defined above. Enter the information in the form and you’ll see the JSP page displaying the information entered into the form. With radio buttons, you can only select one at a time, but with check boxes, you can select all the boxes. We are just going to replace the radio buttons we created in the last form with checkboxes. The rest of the information and the form remains the same. So that is all about reading data from HTML forms. From the next tutorial, we are going to learn state management in JSP.